In a bid to tap into the changing demands of the savvy millennial workforce, Deloitte France is using video recruitment services to transform its recruitment process for interns and junior candidates. Alongside bolstering brand attractiveness towards millennials and Gen Zs, the new recruitment method allows Deloitte’s recruiters to better assess important interpersonal and often intangible “soft” skills. Identifying the changing recruiting and lifestyle demands, Deloitte’s Lille office was the first within the company’s French network to turn toward video-based recruitment. Every year, the office seeks to recruit dozens of junior members – auditors and consultants – and interns. From early 2016, the firm’s recruiters began using video recruitment to fill a large amount of these roles. “By using Visiotalent, Deloitte can meet more candidates and manage a larger volume of applications,” a Deloitte recruiter said. Contrary to the standard application process, which sees a CV reviewed by a recruiter, mostly in combination with a first-round, hour-long interview, the video recruitment approach allows recruiters to get a first impression on a candidate’s personality, presentation, and critical thinking skills in mere minutes. Candidates can either be asked to send recruiters a video profile, or be invited to participate in a short video interview. Visiotalent is a provider of video interview tools founded in 2014 by French entrepreneurs Gonzague Lefebvre and Louis Coulon. Leveraging video technology, the company believes the efficiency and overall experience of candidate screening can be improved, for both interviewer and interviewee. Visiotalent is used by more than 450 companies in Europe including Blablacar, ING, Thalys, KPMG, and Deloitte. Deloitte has so far used the technology to bring on board more than 30 juniors and 25 interns. One of the key benefits of using software such as Visiotalent is the ability to scale decision-making. After conducting an interview, the video material is stored online. If a recruiter has doubts about a certain candidate, or would like someone else’s opinion, the video footage can be instantly sent to that person, transforming recruitment into a fully team-oriented process. The main benefit to video recruitment is how it can unpack a candidate’s personality, revealing their soft skills. Soft skills, which include teamwork, problem-solving capabilities, creativity, and adaptability, are often left off of CVs, and are more difficult to evaluate than technical skills, which are objectively measurable and easily identifiable. But in professional services, the arena in which Deloitte operates, interpersonal skills are key; in fact, according to many, soft skills are what differentiates good accountants/advisors from the rest. It is therefore key that Deloitte knows as much as possible about a candidate’s soft skills as early in the hiring process as possible. Deloitte’s foray into video recruitment is part of a broader trend in which technology is being adopted to facilitate a more efficient, streamlined approach to the recruitment process. According to LinkedIn’s global study of 9,000 HR professionals, new technology and tools are the top trend within the profession, used to bolster aspects such as candidate searches, selection, screening, managing candidate experience, and on-boarding. The candidates, too, are enjoying the ride, according to Deloitte’s evaluation of Visiotalent’s data. It all starts in preparation mode, a tool that helps candidates prepare for their interview by sending out a step-by-step manual, a training module, tutorials, and coaching programmes. The training module simulates a real-life interview, just like one a recruiter would prepare, but with fictional questions. This approach offers candidates the chance to familiarise themselves with the questions and the application itself. Once ready to go, candidates can make recordings and afterwards watch themselves, practicing and perfecting their performance ahead of the real interview. “The possibility to simulate an interview allows candidates to become aware of their interpersonal skills - verbal and nonverbal - and to learn how to put forward their soft skills during the interview. The best way to put forward your communicational, leadership or problem-solving skills, is to be yourself and emphasise your strengths and soft skills,” Visiotalent co-founder Coulon said. With more than 15 offices across France, Deloitte is one of the country’s largest professional services firms, supporting clients with audit, consulting, financial advisory, and tax services. Globally, Deloitte has 286,000 employees in more than 150 countries, with Punit Renjen at the helm. Management consulting firm Boston Consulting Group wants to increase its number of new hires in Germany and Austria in 2019, continuing a trend of consistent headcount growth. Outgoing BCG Germany boss Carsten Kratz has informed German newspaper Frankfurter Allgemeine the firm plans “to hire a total of 750 new employees, about two-thirds of them consultants.” A high turnover of employees is common in the consulting industry, so of BCG’s targeted intake, half of the new hires this year will occupy already existing jobs, but the other half is likely to constitute real growth. Already in the past two years, the consulting firm has hired around 500 new employees. 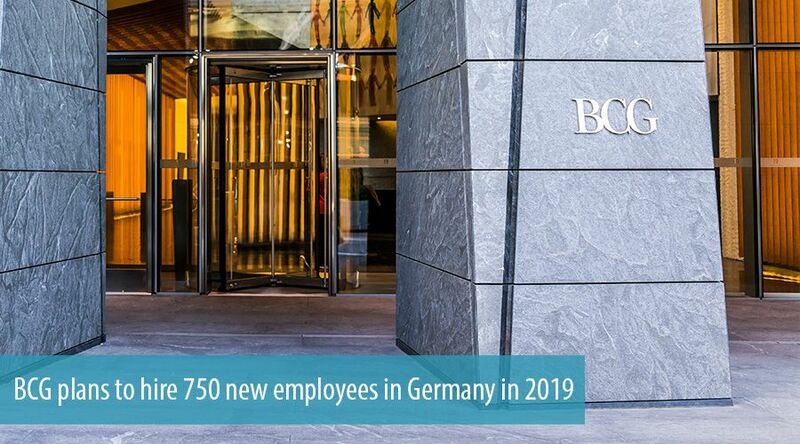 BCG now employs about 2,600 consultants and staff in Germany, and around 16,000 people around the world. One recruitment target the firm has set is to raise its diversity profile, a feat which the highly popular Kratz has had less success with during his tenure. As it stands, only 10% of BCG Partners are female, with the proportion of women among consultants now 25%. While the share of total recruits who are women is higher (35%), Kratz highlighted that it is difficult to raise the proportion of women in the upper levels of the firm’s hierarchy, as women are often underrepresented in the subjects from which graduates are recruited to become advisors, such as economics and natural sciences. According to Kratz, the problem becomes even more difficult later, stating, "Many of our best women are approached by head-hunters.” Kratz will pass the baton to Matthias Tauber at the start of April, and broadly he will be able to look back at good performance for the firm during his stewardship. Revenue of Germany and Austria has increased from around €510 million in 2013 to an estimated €930 million in 2018. BCG now employs 16,000 people around the world - estimated at about 2,600 in Germany. At the same time, the number of Managing Directors, as the Partners are called by the consulting firm, has increased from 110 to more than 155 during this time. He also diversified the firm, which launched data analysis subsidiary Gamma and incubation wing BCG Digital Ventures under his supervision. On top of this, BCG subsidiary Brighthouse opened in Berlin, providing companies with ‘purpose consultancy’ services. Germany was already home to BCG Platinion, which is the firm’s technology implementation wing. Growth booked under Kratz’s wings has enabled BCG to narrow its gap with McKinsey – the world's number one strategy consultancy – in the DAH region (Germany, Austria and Switzerland). The global segment for strategic consultancy services is estimated to be between 15% and 20% of the total market, which roughly equates to a size of $4 to $6 billion. According to industry experts, BCG is thus almost on par with McKinsey in Germany. While exact figures on market shares in individual countries do not exist, data sourced from BDU however, Germany’s association for consulting firms, shows that German management consulting market is currently worth over $30 billion.